I am beyond excited to be partnering up with my friends over at ALDI to share a special, fall-inspired recipe with you all today! It’s no secret that I am a huge fan of ALDI. 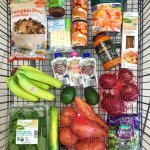 I do the majority of my grocery shopping there and share my hauls on IG almost weekly. 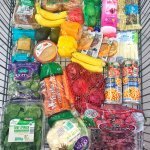 I just love the fact that I can find tons of fresh produce, dry & frozen foods to create nutritious meals for my husband and I to eat all week long, and it is incredibly affordable. You simply cannot beat the prices at ALDI, and the best part? You don’t have to sacrifice quality. They are all about offering customers high-quality products that taste amazing, but don’t break the bank. They also encourage shoppers to bring reusable grocery bags, so they clearly care about the environment, which is another reason I love them so much! I don’t know about you, but I am so excited to make some heartier, fall dishes and get creative in the kitchen over the next few months. Summer produce was fun & delicious while it lasted, but I’m definitely ready for some crockpot meals, soups, comfort dishes — oh, and pumpkin-flavored everything, like the recipe I’m about to share with you! Fall basically marks the beginning of the holiday season, which means there are a lot of parties to be had in the near future. I always gravitate towards dips and snack mixes like this at social gatherings. If you can’t find me, just look to the snack table. (But seriously.) This party mix is bursting with flavors that will give you all the fall feels, and will most likely keep you hovering over the snack table, too. Sorry I’m not sorry. The best part is that it includes healthy and high-quality ingredients. You’re getting some whole grains from the old-fashioned oats, cereal and popcorn, heart-healthy fats from a variety of nuts and seeds, natural sweeteners like maple syrup and vanilla, and items that are simply good for the soul, like chocolate & butterscotch chips! I included several items from the ALDI-exclusive brand, SimplyNature, which features simple foods free of artificial colors, flavors and unnecessary enhancers. Their products range from pantry staples, such as cereal, honey, maple syrup and pasta sauce, to fresh items like bread, milk, kale, salad mixes and yogurt. And the line is growing – more organic items are being added every month. That’s another thing I love about ALDI. They are constantly bringing in new products to keep things fresh and exciting! But they don’t stay forever, so you have to jump on them quickly! 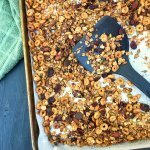 A simple, fall-inspired recipe that you can serve as granola with milk or throw on top of your favorite smoothie, or spice it up for a special occasion by adding popcorn and other tasty toppings! Preheat oven to 350 degrees Fahrenheit and line a large, rimmed baking sheet with parchment paper. In a large mixing bowl, combine the old-fashioned oats, Pumpkin Crispy-O's, pumpkin spiced almonds, pepitas, chia seeds and spices (cinnamon, nutmeg, ginger, cloves, allspice). Stir to blend. Combine the melted coconut oil, maple syrup and vanilla extract in a small bowl, then pour into the large bowl. Mix well, until all ingredients are lightly coated. Transfer the granola onto your prepared baking sheet and use a large spoon or spatula to spread it into a flat, even layer. Bake until golden, about 18-22 minutes, stirring halfway (around 9 minutes). pour the granola back into a large, clean bowl and add popcorn. (Equal parts granola to popcorn, or as much as desired). Stir so that all ingredients are evenly distributed. Store the granola/party mix in an airtight container at room temperature for 1-2 weeks. Disclosure: this post is sponsored by ALDI; I was compensated monetarily in exchange for social promotion of ALDI fall products and recipe development. Click this link to check their store locator and find an ALDI near you so you can check out all of their new fall products, and try this delicious recipe for yourself! It’s so easy to make, and it’s sure to be a crowd pleaser, whether you are hosting friends, or having a relaxing movie night at home with the fam! If I want to use pumpkin pie spice instead of each individual, how much should I use? I would say probably 1.5 tsp! !